Looking past the former combing sheds, on the right, towards New Mill with its elegant, Italianate style chimney. Salts (or Salt’s)* Mill was built 1851-53 for Titus Salt by local architects Henry Lockwood and Richard Mawson. When it opened in 1853, it was the largest industrial building in the world by total floor area and employed approximately 3000 workers. It was one of the most modern in Europe and boasted many features such as improved smoke burners, flues to remove dust and dirt and incorporating noisy machinery in the lower levels to suppress the noise. The factory in full production had 1200 looms and could produce over 30000 yards of cloth a day Link . The mill closed in 1986, with renovation beginning the following year. It now houses a mixture of business, commerce, leisure including several large rooms given over to the works of the Bradford-born artist David Hockney , shops, restaurants and cafes. It is also home to microelectronics manufacturer Pace. It is a grade II* listed building (English Heritage Building ID: 337546 Link British Listed Buildings). * The spellings Salts Mill and Salt's Mill (ie. with and without an apostrophe) are both commonly used. 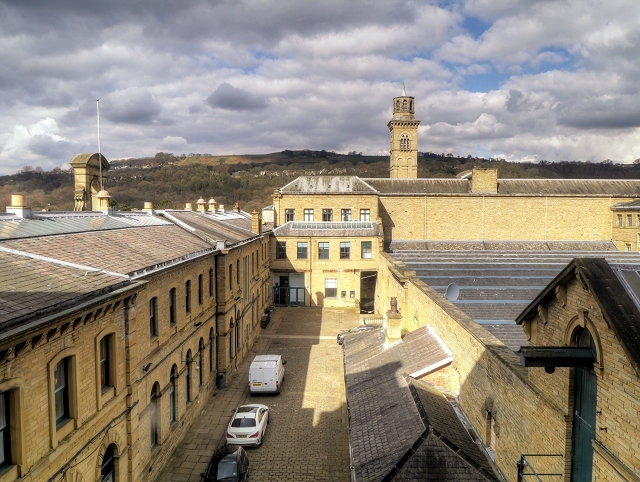 The former is used consistently by the Salts Mill website Link and the Saltaire Village website Link ; the latter by Visit Bradford from the official Bradford Tourist Information service Link . Saltaire is a Victorian model village on the outskirts of Bradford, by the River Aire and the Leeds and Liverpool Canal The village takes its name from Titus Salt, a Victorian textile magnate and philanthropist who built a mill and a village to house his workers. In December 2001, Saltaire was designated a World Heritage Site by UNESCO (Link for a site plan of Saltaire showing the overall layout and the boundaries of the UNESCO World Heritage Site). The vast majority of buildings in the village have been individually designated as listed buildings by English Heritage.